Whether you are looking for suitable shoes as a mountain bike rider, performance road biking racer, or just simply somebody who likes to cycle, you need the best cycling shoes you can get to offer you the comfort and support you need when riding. We take a look at the different types of cycling shoes on the market, looking the different cleat systems and how they work with the city bike to help you power pedal. We look at the material used in their construction taking into consideration their durability, stability, and breathability The type of bike cleats, design, and style of the shoe and their weight will all determine how they will benefit you as a rider, no matter what type of riding you do from indoor riding, spinning or taking the long trail cross country. 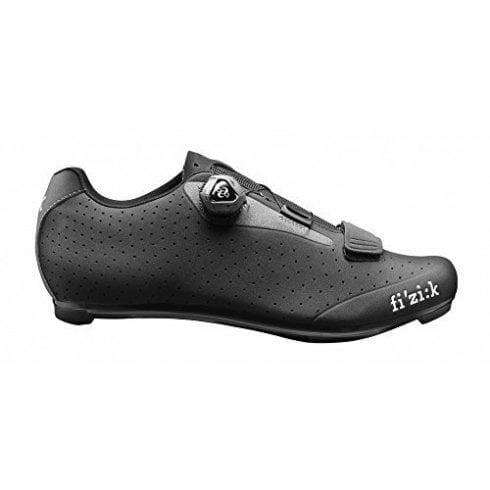 View the Best Shoes for Cycling, Below. Which Cleats are Best for Cycling? For cross country running shoes click here. Choosing the right shoe to meet your requirements is essential if you want to get the most out of your cycling weekly and we are here to help you with our list of top ten cycling shoes on the market in 2019. Need to know where to start? Read our buyers guide and beginners guide down below. Are you a Tennis player? Check out our review of the top tennis shoes. 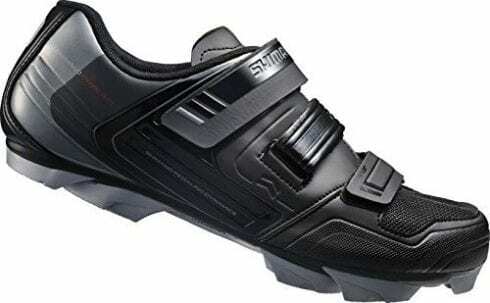 Shimano is a well-known brand of mountain cycling shoe designed to be used when doing competitive road races or TT events. They offer a range of features that are designed to give you the edge when competing and are sure to get you on the winning path. Combining comfort, style and high-end features, this cycling shoe enables you to get a powerful performance when pedaling up or down hills. It is a lightweight shoe with a stiff carbon composite construction, which will allow you to turn effort into energy and it, will absorb the vibrations from the bike. A synthetic leather upper combined with open mesh with a "surround" upper pattern, will keep your foot ventilated, cool and dry throughout and the dual-density insole offers heel stability. Dual hook-and-loop offset straps have an adjustable mechanical closure system will provide you with a pressure-free fit and keep your foot secured at all times. The cleat mount is adjustable and because it is wide, it offers a range of adjustment to suit any rider and makes for the best shoe-pedal fit you can get. A feature-packed cycling shoe that is designed to match your competitive spirit and get you racing at your best. Wide cleat system, mechanical adjustable closure, dual density insole, "surround" upper patter and stiff carbon-composite construction are just some of the features to give you that competitive edge when racing. This cycling shoe is designed to give you that competitive edge and is one of those worn by the pros. Weighing in at a mere 580 grams this shoe has a Microfiber Techpro and mesh upper with is extremely lightweight and the double Techno-3 push system offers the perfect customized fit. One of the best road cycling shoes on the market it offers a vent carbon sole which offers you all-weather comfort, along with superb power-transfer. The heel cup is both stabilizing and supportive. A top of the range shoe with an even better aerodynamic upper with Tecno-3 dials for a symmetrical closure. The style of the shoe is striking with embossed graphics, which are not only great looking but also aid airflow around the shoe and are designed to allow for venting above the toebox and on the side, keeping your foot cool and dry even during hot days. The Vent Carbon sole and Wire Carbon construction of the shoe is engineered to enhance your performance and boost the ergonomics of the shoe. The sliding vent at the toe of the shoe offers the rider the ability to tailor-make their level of airflow beneath the toebox. The heel pad and toe guard on this fantastic road-racing shoe are removable and replaceable when they start wearing thin. One of the lightest cycling shoes and already a favorite on the pro leader circuit the features on this cycling shoe are astounding, with a vent carbon sole, techno-3 push system, embossed graphics that also allow for great ventilation, wire carbon construction and sliding vent at the toe, this shoe is sure to enhance your performance. 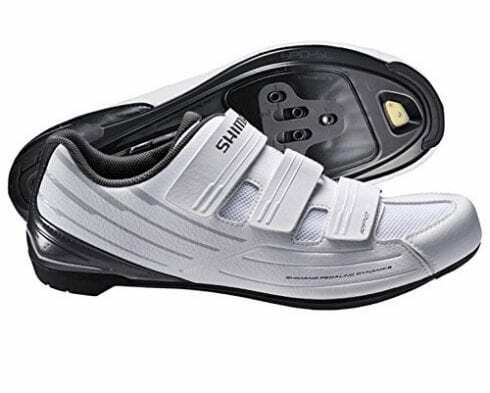 So you have just taken up cycling and don't want to spend a fortune on a cycling shoe, the Shimano Women's SH RP2W not only offers all the features of a great cycling shoe, it is also extremely reasonably priced. Designed for those who like to ride recreationally, it features a synthetic leather upper, which is stretch resistant and which will help keep your foot stable and protected as you cycle. The intake/exhaust system ensures that you get the required ventilation when cycling keeping your foot cool and dry throughout. A triple asymmetric strap spread relieves those pressure points that can lead to sore feet, spreading the force evenly over the top of the foot. A lightweight shoe with a fiberglass-reinforced nylon sole, which ensures you get the stiffness, you need to pedal efficiently while being compliant enough to ensure comfort. The ergonomic fit of the shoe features a narrow heel cup with reduced volume. Offering a smaller toe box to cater for a women's foot along with extra support at the instep. SPD and SPD-L compatible perfect for both indoor and outdoor riding, the wider cleat adjustment range of the shoe ensures the perfect shoe-pedal fit. The cleat is 2 and 3-bolt compatible. One of the best women's cycling shoes for beginners on the market with a host of features including stretch-resistant synthetic leather uppers, triple asymmetric strap spread and a lightweight fiberglass-reinforced nylon stiff sole with a wide cleat adjustment range. Perfect for indoor and outdoor cycling and SPD and SPD-L compatible. A superb mountain bike cycling shoe that offers the support, stability, and comfort you need for both on or off the bike performance. The Vibram rubber outsole will offer you the best traction and is suitable for on foot pursuits or use with flat road bike pedals. The heat moldable SPD compatible shank offers an optimal cleat zone for stiffness, while the precision fit last will mold to the foot without causing any discomfort. The heat moldable EVA foot bed and midsole offers medium arch support for extra comfort of this cycling gear and allows you to power through your pedaling while the rubber outsole offers superb comfort when walking or raising your heart rate. The microfiber and mesh upper is both breathable and flexible while also being water-resistant. The adjustable, non-slip laces will ensure you get the best fit and the hidden lace pockets ensure that your laces will not snag, not only is it SPD clipless compatible, but also works with flat pedals and toe clips with straps. Superb mountain biking performance shoes that offer you the features to carry you through the difficulties MTB racers face, for womens and mens cycling. A Vibram rubber outsole offers excellent traction when on foot and the heat moldable SPD offers optimal cleat zone. Molded EVA foot bed and midsole, microfiber and mesh upper and non-slip laces all add up to a great road bike shoe for mountain bike riders. There are other popular performance shoes in this brand such as the giro empire slx, giro factor techlace, giro prolight techlace and more. Shimano does it again but this time a mountain cycling shoe for the mountain bike rider with exceptional features that are engineered to give you the edge both on and off the bike. This MTB shoe is designed with a mud-shedding, polyurethane outsole with arch pad for pedal stability even when unclipped. The fiberglass reinforced nylon sole is lightweight with just the right amount of compliance and stiffness. The ergonomically designed Shimano Dynalast will secure the foot in the shoes and pedal to allow you to have a very efficient upstroke. Stretch-resistant synthetic leather upper is strong and durable as well as being lightweight. The cup insole will mold to your foot and accommodates almost any size and shape of foot. The three offset straps will ensure that your foot remains secure in the shoe and along with triple asymmetrical strap and cross X-strap will eliminate any pressure points and relieve the tension on the top of the foot, especially during the push-off motion. The ultimate mountain bike shoes designed to be effective when on or off the bike. The mud-shedding, polyurethane outsole, arch pad, fiberglass reinforced nylon sole and three offset straps along with triple asymmetrical strap and cross X-strap and Shimano Dynalast ensure that you will get the most out of your cycling experience. This is a road cyclist shoe of choice; it is lightweight and durable with features that allow you to power through those long rides with great pedal technique. 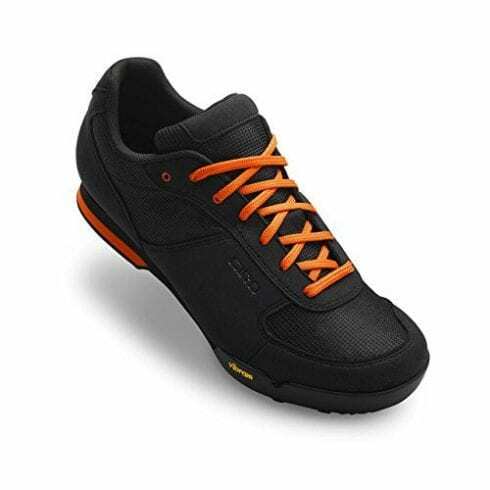 The Microtex upper material of the boa road bike shoe is breathable allowing great ventilation. It is not only lightweight but also very flexible to ensure utmost comfort. The micro-strap closure and single BOA IP1-A closure control, allows you to adjust the fit quickly and easily and keeps your foot securely in the shoe at all times. For added protection, the heel has a large reflective strip on it to ensure you remain visible during early morning and late afternoon or evening rides. The sole of the shoe is constructed from carbon-reinforced nylon that is engineered to be stiff enough to help you in efficient power transfer. The insole offers great support to your heel ensuring that every ounce of energy put out goes into your pedals. A unique aspect of this shoe is the Boa Volume Control. This allows you to individually change the shape of each shoe to adapt to your foot, molding it to the foot and giving you ultimate comfort - with the help of heat moldable cycling gear. 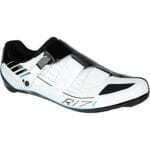 A fantastic cycling shoe for road riders that offers a number of features designed to enhance your riding ability. A Microtex upper that is lightweight and breathable, micro-strap closure and BOA IP1-A closure control and carbon reinforced nylon sole along with the unique Boa Volume Control, which adapts to each foot individually. A superb mountain bike cycling shoe that offers a host of features to keep you in the race whether you find yourself on foot or on the bike, these shoes have what you need in durability, breathability, and support. The upper material of this Giro womens and mens shoe is synthetic leather and features a three hook-and-loop strap closure system. The foot bed of the shoe is molded EVA and it offers medium arch support. The foot bed is designed to cradle your foot, this reduces fatigue and helps you power through. The outsole is co-molded nylon and rubber. The shoe is extremely rugged and offers enough traction and stiffness to enable you to get the power you need up those long hills. The pre-drilled holes that you find under the toes are there to offer you the option of toe spikes when you are taking on those really difficult trails that will involve a lot of sections where carry and walk will be necessary. Cleat compatibility is a 2-bolt mountain. This shoe not only looks good and is reasonably priced, it has everything you need to impress your fellow riders and give you the boost you need when tackling difficult trails. 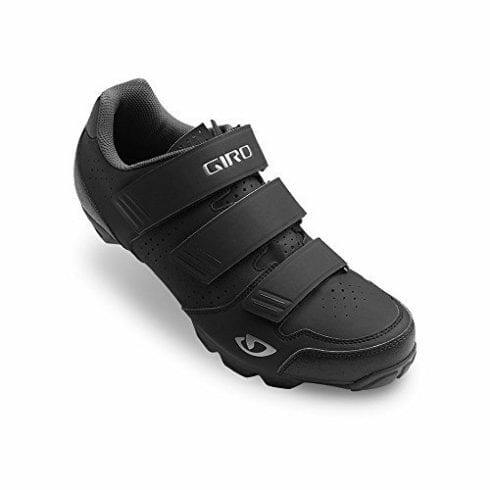 When mountain bike riding you need a shoe that can cope with on and off the bike situations and the Giro factor Carbide R does just that with a durable synthetic leather upper, molded EVA foot bed, co-molded nylon and rubber outsole and the option of using toe spikes with predrilled holes under the toe. 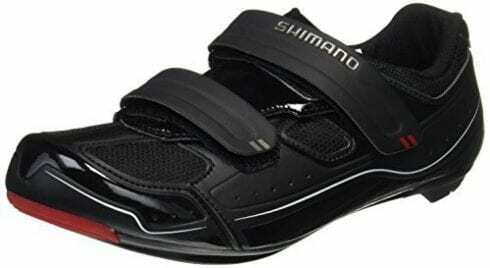 Shimano does it again with this great pair of shoe items that are comfortable, durable and breathable with great quality and excellent fit to make your next ride an enjoyable one. The fabric and synthetic upper with is a high-density leather and mesh combination material, with a dual hook-and-loop strap provides a comfortable secure fit with excellent support. The sole is a lightweight fiberglass reinforced nylon polyamide, which is designed to be rigid which helps you to get the best power conversion when pedaling. The shoe is designed for both outdoor and indoor riding with SPD and SPD-SL cleat compatibility. Ventilation is vital when road riding and the intake/exhaust system on the shoe allows for continuous airflow keeping your foot cool and dry throughout, the Shimano Dynalast is energy efficient, and will secure the foot in the shoe at all times. The insole is flat, this provides uniform underfoot support for ultimate comfort. The cleat is wide to allow for a great adjustment range and will fit the pedal perfectly and for extra protection, it offers a reflective print on the heel for when riding in any lighting conditions. A great road cycling shoe that offers a host of fantastic features such as dual hook-and-loop strap to keep your foot securely in the shoe, lightweight fiberglass reinforced nylon polyamide sole and wide cleat adjustment. The Shimano Dynalast helps you to power through those difficult sections with great power transfer from foot to pedal. The Shimanos rc7 is another great offering from Shimano with a host of brilliant features to make your cycling life a little easier and more enjoyable. The lightweight carbon fiber composite material sole is rigid to allow for great power transfer, the leather and fabric upper is durable and lightweight and the Shimano Dynalast helps you to reduce braking loss when riding. The Powerzone wire guide with front strap is engineered to keep your foot secure in the pedal while the Boa IP1 dials allow you to adjust the strap to eliminate pressure points and make your ride more comfortable. Perforations in the leather uppers will ensure that you get the ventilation your foot needs to stay cool and dry throughout. It also molds to the foot offers great support and an excellent fit. This is a race day shoe that offers you superb pedaling efficiency and superb performance on the road taking your competitive edge to the next level. Power through during race day and take your riding to the next level with a shoe that offers a host of brilliant features such as a Powerzone wire guide with front strap, Boa closure dials, and Shimano Dynalast. Great ventilation and support allow you to get the most pedaling efficiency from the shoe. You can also try the Shimano SPD as an alternative. This is a very affordable, feature-packed shoe that is designed for indoor or outdoor cycling at its best. The synthetic material is breathable, lightweight and durable and also great looking. The fit of the shoe is engineered to enhance your pedaling ability while the hook-and-loop straps will ensure that your foot remains securely in the shoe at all times. The sole is glass fiber reinforced nylon, which is lightweight and extremely comfortable and designed to fit securely on your pedal. The shoe is SPD and SPD-SL cleat compatible so is perfect for those hard indoor training sessions. The shoe offers added protection when riding with a reflective print on the heel cup to ensure you remain visible on that early morning or late evening ride. Comfort, style, support, stability, and breathability all come together in this fantastic, well priced Shimano shoe to give you ultimate performance on the road. 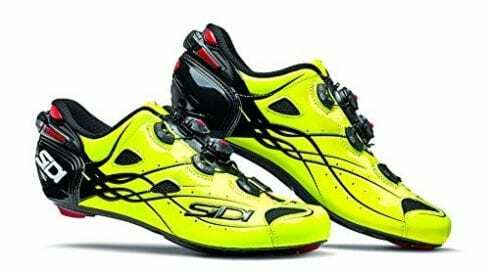 A very affordable and comfortable road racing cycling shoe that offers SPD and SPD-SL cleat compatibility making it perfect for indoor training as well as outdoor riding. The glass fiber reinforced nylon sole is lightweight and durable with a hook-and-loop closure strap for stability and a secure fit. When you take up cycling, you need to get the right equipment, including a quality bicycle, clothes and of course cycling shoes. When deciding what road shoes to buy you need to consider the material that they are made from, including the soles, uppers, and outsoles. The cleat system is also very important to take into consideration, especially due to the fact that the cleat systems have to match the pedals that you have on your bike. Although there are a few brands that are compatible with any type of pedal system, they are not the norm. Another aspect that you need to consider is the gender-specific qualities of each shoe. Just like a woman will select a bike that is specifically made for her, but also a shoe that is designed to complement a woman’s foot for women’s cycling. Read on for the full road biking shoe buyers guide! The material of the shoe is important. It should be lightweight and highly durable as well as being flexible in the uppers to mold to your foot and stiff and rigid in the sole to ensure that you get the most power out of you’re pedaling efforts. Many of the road racing bikes have ultra-light carbon fiberglass soles that are designed specifically for pedaling and being on the bike. Whereas, the mountain bike shoes are a little less lightweight and often have a rubber outsole and sole with the option of having spikes in the toe area. This is because mountain bike riders often have to get off their bike and push their bike or carry it over the most difficult parts of the trail you are riding. Uppers on road bikes and mountain bike shoes should offer you a lightweight, durable material such as synthetic leather and mesh. On mountain bikes, the material of the shoe should also prevent mud from sticking to them and be waterproof shoes in nature. Having a gender-specific shoe is important as men and women have different types of feet. Women tend to have narrower and smaller feet and need more support in the midsole than men do. This means that a lot of the ladies shoe on the market feature a narrower fit. Men tend to have wider feet and need to have a wider foot and toe area. Both, however, should have adequate support in the heel and midsole and both should have stable, stiff soles to enable them to get the most power when pedaling. The cleat system that you use will depend on what type of biking you are going to be doing, we take a look at the two most popular forms and how to use the cleat system on both road and mountain bike pedals. As well as those who use clipless pedals such as casual riders and commuters. These cleat systems are designed to be worn on the electric bike or hybrid bikes. They are not meant to be walked in at all and usually have fiberglass sole, which is stiff and rigid, great for power pedaling but not good for walking in. 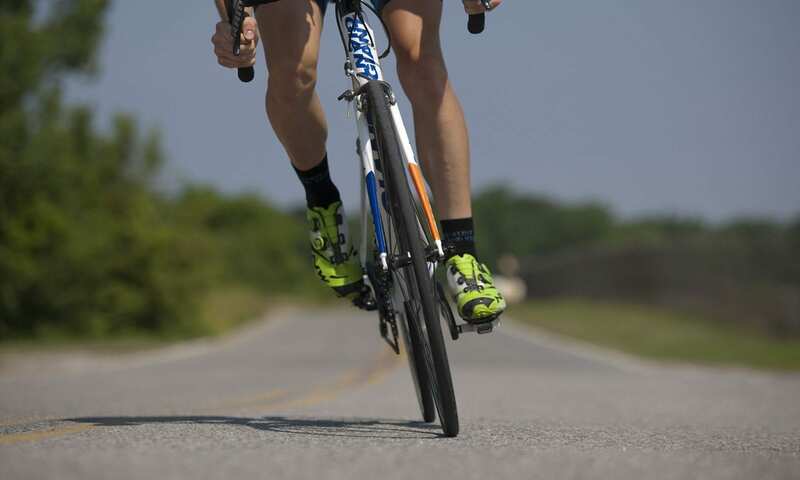 Road pedal cleat systems are designed for racing and riding long distances with. These cleat systems are designed not only to be used when riding but also when walking. The soles of these biking or triathlon cycling shoes are not as stiff and rigid as a road bikers soles and often the cleat system on these shoes are tucked away in order to keep them away from the mud and the grime that mountain bikers are exposed too, especially when they have to carry or push their bikes over the rougher, muddier terrain. 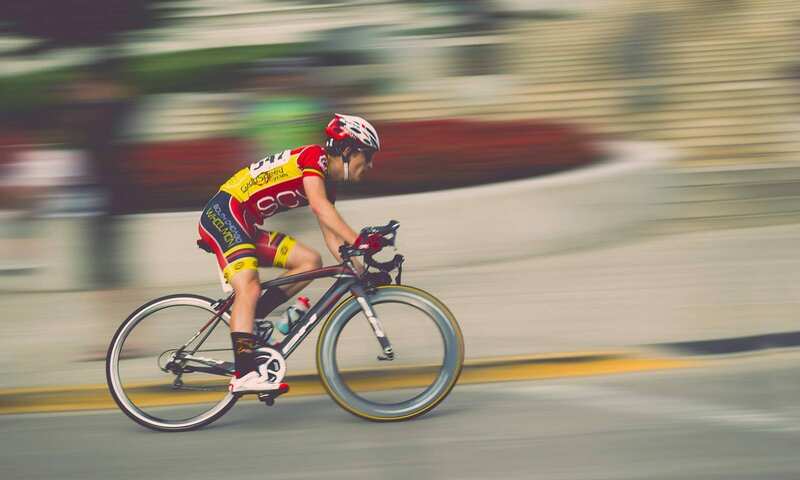 They often have a bit of float in them, in that they allow for a little more movement of the foot on the pedal, this is because the mountain bike rider will not have a smooth rider like the road racer will. These are for people who are casual bikers; they like to ride or ride to commute. They will also have a cleat system that is tucked away and they clip into their road bike pedals, disengaging your foot is easy, just twist the heel, this is vital for commuters in particular as they will often have to steady themselves when at robots or stopping frequently along the road. These bike cleats will often be on the balls of your feet and often you have double-sided pedals so you can mount from either side of the bike. Cycling shoes are those shoes that are specifically designed and engineered for cycling. They are specialized shoes and come in a variety of designs, depending on what type of cycling you want to do. This includes road or track racing, Mountain biking or off road cycling, casual riding, touring or winter riding as well as indoor cycling and spinning… not to mention the tour de France! The main features of any cycling shoe includes rigidity, this allows for the transfer of power from the foot to the pedal, weight of the shoe, way of attachment to the pedal, such as a cleat system, and the ability to use the shoe on or off the bike which is essential when mountain biking or trail riding. Many of the high-performance cycling shoes offer a quick-adjusting system to tighten the shoe to your foot eliminating the need for laces, which can get hooked or caught up in the pedals. There are many different cycling shoes to fit the different types of cycling you enjoy. Below is a summary of the different types of cycling and the shoes that are specifically designed for them. This is one of the most popular forms of cycling, whether it is casual riding or road racing. These types of cycling shoes usually have a leather and nylon mesh upper with a lightweight fiberglass nylon sole that fits securely on the shoes and pedal. The soles of these shoes are generally rigid and you will attach a cleat system to the bottom to allow you to fix your foot in the pedals for better pedaling efficient power transfer. These types of shoes are not designed for walking, but for being in the saddle of the bike and are measured by their fit, rigidity, durability and the lightness of their construction. This is one of the fastest growing sports and is becoming ever more popular around the world. Mountain bike shoes usually use the two-bolt SPD-style cleat, which is designed to be used with a clipless pedal. 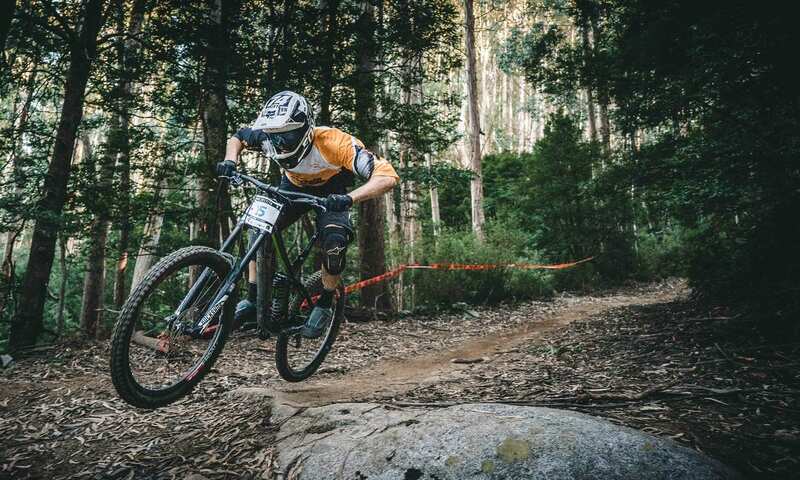 Mountain bike shoes often have a less rigid outsole, which is designed for when the rider has to walk, run and push or carry the bike over the rougher terrain of the trails they are riding. They will often accommodate two screw-in spikes on the toe to allow for better traction when walking. The insoles of and midsoles of the shoes are cushioned for comfort when riding and walking and the bike cleats that are used are usually depressed under the treads of the sole to ensure they remain clear of the ground when walking. These are different to your standard road shoe in that they usually have a softer outsole that is less rigid and a heat moldable midsole for comfort. Read this study on the effects of cycling shoe outsole materials. They are designed with a lugged pattern on the sole to allow for walking. The shoe is designed to transfer energy from the foot to the pedal evenly and protect the foot against pressure points. Clipless pedal cleats are usually used to allow for on and off bike use, the bike cleats are usually of the SPD types. The basic tenant of a cycling shoe is that it keeps your foot securely on the pedal to ensure that you are able to get the most power with each upstroke. Setting up your cleats properly are essential to getting the most out of your shoes and cleat system. There is no one best cleat for cycling, there are a number of cleats on the market and they are designed to be worn with specific pedals, and although there are a few exceptions to this, with some two-bolt systems being compatible across brands it is not the norm. When you select the best cleats for you to use, you will have to check which pedals you have to ensure they will work. If you are set on a certain type of cleat, you can also change the pedal on your bike to allow you to use them though. The choice of cleat system not only depends on what type of riding you are going to be doing but also on your own personal preference and of course what pedals you have on your bike. When you are engaging in any sport or activity it is always best to get the shoes that are designed for that specific activity such as basketball, indoor soccer (click for the top indoor shoes), outdoor soccer (click for the top 10), football, or cycling. Cycling shoes are designed to give you the best pedal power, keep your foot secure when cycling and allow you to get the support for your foot that you need when riding. Having a pair of cycling shoes will help to prevent cramping when riding long distance, and will keep your foot securely in your pedals at all time. The cleat system ensures that your foot is stable and locked in and the stiffness of the sole and the rigidity of the uppers of these types of shoe will ensure that you get the best power transfer from foot to pedal making your cycling easier, more comfortable and more enjoyable. A good cycling shoe will help you to take your cycling to a new level of competition. Choosing the right cleats to match your pedals and type of riding you do will determine what type of cycling shoes you will require, but no matter if you are a mountain biker, a road racer or somebody who just likes to cycle recreationally wearing the correct cycling shoes will help you to enjoy cycling a whole lot more. 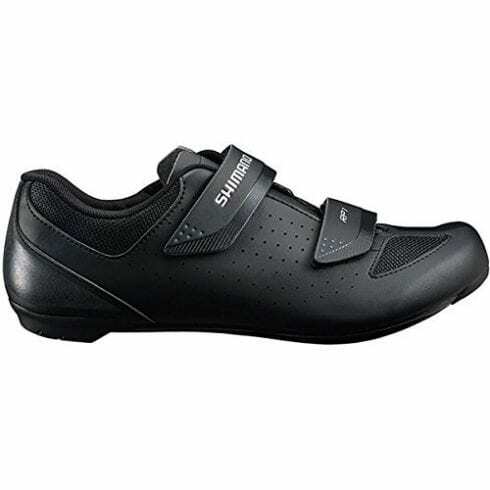 Shimano is a top cycling shoe brand that delivers quality shoes to cyclists worldwide and the Shimano Men’s Sh-r171 is no exception to that rule. It is engineered for excellence in road races and TT events and is our top choice of cycling shoes for 2019. The features of these great cycling shoes enable you to get the most out of your pedaling power, with a lightweight design, stiff carbon-composite construction and synthetic leather and open mesh upper with a “Surround” upper pattern. All of these features are designed to keep your foot secure, ventilated and comfortable throughout your ride. The dual-density insole of the cycling shoe offers you stability in the heel, which again allows you to power through long rides, and the dual hook-and-loop offset straps offer a pressure-free fit with a mechanical closure system that is easy to adjust and tighten. The cleats mounts are adjustable to fit any size foot, as it is a wide range. It is also designed for the best shoe-pedal fit on the market compatible with most pedals around. A racing style shoe that is designed for ultimate performance, comfort, and support and is a favorite on the pro cycling tours. The Sidi Shot weighs in at a mere 580 grams making it one of the most lightweight performance shoes around and the Microfiber Techpro and mesh upper with Techno-3 push system offers you a customized fit to ensure that your foot gets the support and stability it needs. The stiff carbon sole allows you all-weather comfort, great power transfer and superb support and stability. With its striking looks comes an embossed graphic design, which not only looks great but also offers added airflow around the shoe. The stiff carbon construction enhances your performance taking it to the next level and gives you that competitive edge you need when racing. A sliding vent at the toe of the shoe offers added ventilation and allows the rider to decide on the level of airflow they require. The heel pad and toe guard on the shoe are removable and replaceable. This might be one of the most expensive performance shoes on the market; however, the features they offer along with the durability and quality of the shoe make it our premium choice and well worth the money. The Shimano Women’s SH-RP2W is designed for the female rider who is just starting out on her cycling adventure, it is perfect for those beginners who don’t want to spend a fortune on cycling shoes but want something that offers them all the features and quality that they can get for their money. A shoe that is designed for the casual or recreational rider, it offers a stretch-resistant synthetic leather upper to keep your foot stable and secure while riding and the shoe is very well ventilated to keep your foot cool and dry. The triple asymmetric strap spread allows for great closure that spreads the force evenly and does not push unnecessary pressure on the foot’s pressure points. The fiberglass-reinforced nylon sole offers exceptional stiffness for great pedal efficiency and the shoe offer gender-specific features such as a narrow heel cup with reduced volume, smaller toe box and extra support at the instep. Compatible to be used indoor during spinning classes or outdoors, the wider cleat offers a wider adjustment range and makes it compatible with most pedals. The cleat is 2 or 3-bolt compatible. Exceptional features, great looks, and very reasonable pricing make this our great value choice of cycling shoe for 2019. We hope you enjoyed our article on "The 10 Best Cycling Shoes", if so, please share and rate it.